Source: Financial and Professional Impact in Durham. Photo courtesy Donald Burgess Tilley Jr. This pedestrian-scale bronze sculpture is the fifth in a series of six monuments documenting “Black Wall Street” in Durham. 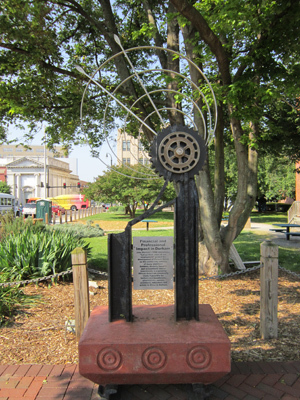 The sculpture features a chain and gears. It highlights the significance of the investors in Durham, who made it possible for many professionals, including barbers, pharmacists, educators, and artists, to thrive in the Durham area. John Merrick's admonition, "Let us think more of our employment" guided the development of Parrish Street as the center city address of many ambitious bankers, doctors, lawyers, and accountants whose investments in a growing African American community made it possible for barbers and beauticians, pharmacists, nurses, architects, educators and artists to thrive in Durham. U.S. Department of Housing and Urban Development. Funds granted with the assistance of Representative David E. Price. The sculpture sits on historic Parrish Street, which is better known as “Black Wall Street." It is part of a series of six sculptures commemorating Durham’s African-American history. This sculpture is in downtown Durham. There are a few trees close to the monument. This monument, and the entire series of Parrish Street sculptures, is part of a larger revitalization effort by the city of Durham. With the help of Representative David E. Price, the U.S. Department of Housing and Urban Development granted $350,000 to the City of Durham’s Office of Economic and Workforce Development for the Parrish Street Revitalization and Historic Commemoration Project. The entire Parrish Street monuments series cost $350,000.